Free West Papua protest in Melbourne, Australia. Photo by Nichollas Harrison, Wikipedia Commons. 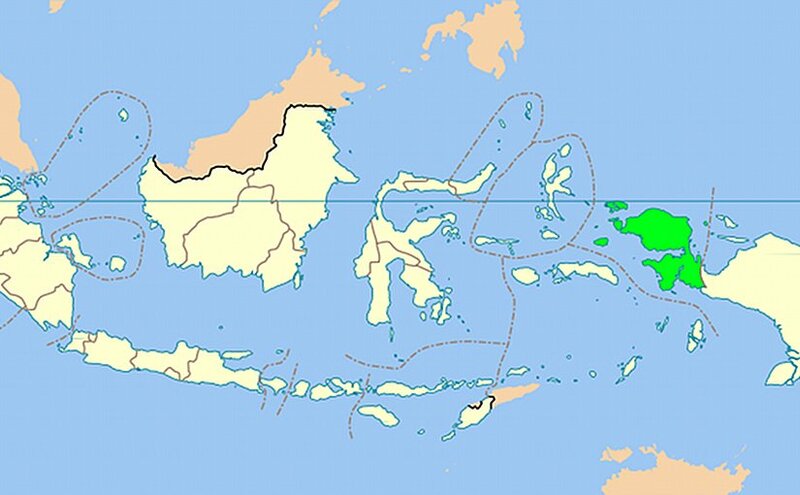 West Papua became the twenty-sixth province of Indonesia in 1969, after the so-called “Act of Free Choice” sponsored by the UN saw the transfer of official administration of the territory from the Netherlands, to Indonesia. With the growing number of nations voicing their support for the United Nations to revisit what has now been widely criticized as a flawed plebiscite in 1969, Jakarta should indeed be concerned that they could eventually lose the re- source-rich territory, an event which could drag Australia into conflict with its restive neighbor. Over the five decades which Indonesia has held official control of West Papua, the indigenous population has endured what has been extensively documented as a repressive system of Javanese-colonial occupation. Based on reports filed by church organizations, missionaries, and the West Papuan diaspora, Indonesian security forces continue to commit what have been labeled as “gross human rights abuses” against the indigenous population, with estimates of civilians killed reaching a half-million since the occupation commenced. These economic and social repressive activities are hidden from the outside world by the Indonesian Government. The Government routinely prevents most foreign journalists from visiting the territory. When considering West Papua, Javanese envisage a huge, rich, empty land mass, vulnerable to exploitation and interference from foreign powers. Papuans are defined by Javanese as greedy, corrupt drunkards who need Javanese guardianship. Racism is prevalent and Javanese consider Papuans as stone-age primitives. The indigenous people of West Papua are of the same ethnic origin as those in the eastern half of the island of New Guinea and are also related ethnically and culturally to other Melanesian peoples of the Pacific. Yet under Jakarta’s Transmigrasi program, the indigenous West Papuans have been reduced to a minority population due to waves of sponsored migrants from Java and Sulawesi. After decades of Dutch colonial governance until 1963, indigenous Papuans constituted 99 percent of the population. Under Indonesian administration since 1963, that figure has fallen to 47 percent. There has always been a deeply-felt sense of kinship and common heritage amongst the Melanesian Spearhead Group of nations towards West Papua. Vanuatu has always been a place of refuge for West Papuan dissidents and independence activists. Indonesia has been aware of this support within the Vanuatu body politic for many years, and has recently sought to counter it. This open diplomatic confrontation was evidence that Indonesia’s diplomatic offensive over West Papua was well underway. The Melanesian Spearhead Group (MSG) came into being on July 17, 1986, as a result of an informal meeting of the heads of government of Papua New Guinea, Solomon Islands, Vanuatu, and a representative of the Kanak Socialist National Liberation Front (FLNKS). The member states now are Fiji, Papua New Guinea, Solomon Islands, Vanuatu, and the Kanak and Socialist Liberation Front of New Caledonia. In 2015, the ULMWP (United Liberation Movement for West Papua), a coalition of West Papuan organizations, was made an observer of the Melanesian Spearhead Group (MSG). The ULMWP subsequently applied for full membership, hoping it would give their movement greater political recognition. This is unlikely to succeed as the leaders of the MSG voted to make Indonesia an associate member, paving the way for stronger cooperation between Jakarta and Melanesian countries. Indonesia’s membership of the MSG has given Jakarta a greater influence in Melanesian politics than the ULMWP. Nonetheless, in January 2017, the Melanesian Spearhead Group began discussions to provide full membership in the United Liberation Movement for West Papua. It is Indonesia’s view that West Papua already falls under its (the Republic of Indonesia’s) representation in the MSG and strongly opposes this consideration because it regards West Papua as an integral part of its territory. Although the MSG’s core philosophy supports decolonization and greater independence in Melanesia, the potential inclusion of the ULMWP is problematic because of Indonesia’s associate membership (granted on on the basis of the Mela- nesian identity of five of its provinces). Currently, Solomon Islands and Vanuatu openly favor the ULMWP’s inclusion, while Fiji and Papua New Guinea remain undecided. Papua New Guinea and Fiji’s hesitancy can be understood, as Fiji continues to share strong trade links with Indonesia and currently receives aid for the MSG’s regional police academy in Fiji. Papua New Guineans support West Papuan liberation. However, Port Moresby continues to vacillate on the issue given that PNG has extensive trade and border relations with Indonesia and would wish to maintain these without any diplomatic disturbances. History was made for West Papua in September 2016 at the United Nations General Assembly when seven Pacific Island nations raised the issue of West Papuan independence. These countries were Nauru, Marshall Islands, Tuvalu, Vanuatu, Solo- mon Islands, Tonga, and Palau. Ireland, Guinea, and the Netherlands have now added their voices to the cause. In April 2017, a global petition for West Papuan self-determination was launched in Papua New Guinea. This historic petition was originally launched in the British Parliament in Westminster on January 27, 2017. Political support in New Zealand for an independent West Papua also continues to grow after 11 members of Parliament from across four political parties signed the Westminster Declaration in May 2017, calling for West Papua’s right to self-determination to be legally recognized through an indigenous Papuan vote. On October 19, 2011, 5,000 academics, politicians, church leaders, and senior tribal leaders established the Federal Republic of West Papua (FRWP) during the Third Papua Congress. They determined its objectives, and elected a president and a prime minister. The Indonesian government immediately charged the President, Prime Minister and organizers of the Congress, with subversion, and they were all incarcerated. The FRWP Department of Foreign Affairs, Immigration, and Trade is the only FRWP institution in the diaspora, under the guidance of an executive who doesn’t live in the West Papuan homeland. The FRWP is yet to receive UN recognition. ASEAN member states remain reluctant to acknowledge the growing possibility that Indonesia may be challenged with losing yet another of its provinces following former Pres. B. J. Habibie’s misstep which precipitated East Timor’s (Timor Leste/Timor Lorosa’e) gaining independence in 2000 from its Javanese, colonial masters. Indonesia fears it will lose control over its West Papuan provinces, reminded by the role played by the Australian movement for a free East Timor in ending what was essentially a genocidal Indonesian occupation there at the turn of the millennium. Indonesia continues to pressure Australia to caution its Pacific Island neighbors against interfering in the West Papua issue and to urges them to withdraw support for West Papuan membership of the Melanesian Spearhead Group. It warns that the issue could pose a “stumbling block” to closer bilateral ties if Canberra fails to adopt a stronger public defense of Indonesia’s position. Although all Australian governments since 1962 have supported Indonesian sovereignty over West Papua, the growing international support for independence is highly likely to continue to negatively impact upon Australia-Indonesia relations in the future, recalling Australia’s support for East Timor’s independence from Indonesia in 1999. Jakarta believes that Australia will eventually support West Papuan independence or has strategic designs on the province. Jakarta is unlikely to readily surrender West Papua as it did East Timor. Papua New Guinea could also become victim to any conflict arising from a territorial fight and that would certainly invoke existing arrangements between PNG and Australia, requiring Australian boots on the ground to protect the PNG’s borders. *Kerry Collison, Foreign Correspondent Jakarta and Melbourne for Washington’s “Defense & Foreign Affairs Strategic Policy” the journal of the International Strategic Studies Association. This article was originally published in Defense & Foreign Affairs Special Analysis, and reprinted with permission. Why is President Habibie’s decision for a referendum in Timor-Leste referred to as a “misstep” in this article?